These are multi-dimensional signs. Each plaque has two acrylic panels connected with stainless steel standoffs for a polished look. 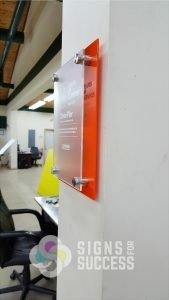 The back panel is standard orange acrylic, chosen premade in that color so the edges and back would be orange as well. We printed grey tones on clear vinyl and applied it to the orange surface. The front panel is clear, non-glare acrylic. For this piece, we reverse printed the white and applied it to the backside of the acrylic panel. This will protect the print from wear and tear. “We used optically clear vinyl. Normal clear vinyl looks hazy, while optimally clear vinyl, you can see crystal clear,” Will said. The plaques were given away as awards to each retiree. There is a custom acrylic hanger on the back of each to hang on a wall. Signs for Success is a locally owned family business in Spokane, and we strive for excellent customer service, perfect color, and quick turnaround on every project. Our large production facility allows us to design, print and install everything in-house. 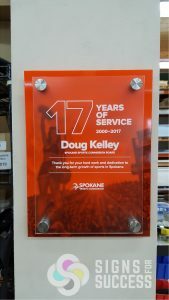 Get quality service and a quick turnaround on custom acrylic award plaques; contact us for a free quote today!